CAPE TOWN – C-sections which are not absolutely necessary are causing division. It is an emotional issue because it is believed that some caesareans carried out are not medically justified. A c section should take place where a vaginal delivery would put mother or baby’s life at risk. Many women opt for the surgery even when there are no medical reasons for a c section. And even though they understand the risks involved for themselves and for the baby. The Council for Medical Schemes suggests that some 70% of births occur in private hospitals where pregnant women are on a medical aid scheme. There are also concerns around the safety of a c section procedure. The My Birth My Choice campaign head also warns that there are long term implications resulting from a c-section, especially for the baby. Only a small percentage of women having a c-section actually want it. A large percentage say they would prefer a natural birth but that their doctors suggested c-section. Is this perhaps because you can earn more money with a c-section? The amount hospitals are paid per procedure are some 50% higher for C-sections than for natural births. Patti Good is the leader of the My Birth My Choice Campaign. She works to lower the C-section rate in private hospitals in South Africa. Professor and gynaecologist, Lynette Denny is from the University of Cape Town. She said that births by c-section were more than 90% in some Cape Town hospitals. Statistics reveal that many women who want a c-section have private medical insurance. This entitles them to choose their doctor and hospital. 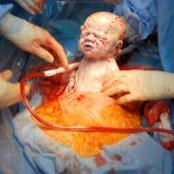 Many senior medical professionals however try to persuade their patients to go for c-section. In fact they would be quite happy with a 100% C-section rate. Many people claim that private hospitals are pushing pregnant women to have c-sections. They say that is because all the medical staff are then able to plan their lives around a certain date. The drawcard with c-sections is that they are safe and far less painful. And that is a comfort that many parents are prepared to pay for. There are doctors who are advocates of natural births, but even they say they understand why more doctors are advising their patients to have c-sections. Insurance premiums for assisted births are higher than ever and obstetricians advise their patients to have caesareans to avoid liability if something goes wrong. Babies born by c-section however are more prone to respiratory problems and to asthma in the long term. The mothers also have a higher risk for bleeding as well as other complications in the future. More womens are opting for c-sections these days. There is plenty of information bouncing around as to which is the better option – giving birth by caesarean or vaginal birth. Both have their own risks, benefits and disadvantages. The only solution to the quandary is for women to do thorough research so that they can make an informed decision. With the right information every pregnant women can be comfortable knowing SHE has made the best choice for her and her baby, and not the choice that suits the private hospitals.